Earlier this year, Nvidia, an American graphics card manufacturer, announced that they were going to begin producing a new line of consumer graphics cards that would allow them to use ray tracing technology. These graphics card would be known as Turing architecture, or RTX. With applications in not only scientific research, but commercial applications, video and image rendering, and video game technology, ray-tracing technology is the future of consumer graphics cards. Many CGI movies today are already designed using ray-tracing graphics. So, what is ray-tracing? Currently, many graphics cards use a form of image rendering known as rasterization. This is where an image is provided using vector graphics (triangles and polygons), and then this image is converted to a raster image, which is more commonly known as pixels. These pixels are then processed by shaders to draw different shades of lighting and then displayed to a monitor or another digital display. This process takes a three-dimensional image and translates it to a two-dimensional screen, which is somewhat inefficient because it has difficulty tracking how light would affect the environment. Meanwhile, ray-tracing takes rays of light from a light source, bounces them off the three-dimensional image and then projects it to a two-dimensional figure without having to go through shaders to identify the brightness of a pixel. Commercial ray tracing will bounce light from a virtual camera, acting as the eyes of the viewer, to a pixel and the object behind it, and finally to the virtual light source. This allows for lighting details such as shadows to become more pronounced. RTX cards are also predicted to be more powerful than their predecessors, with a higher frequency and core count on top of ray tracing support. It will also be sharing memory with its L1 cache for better efficiency. 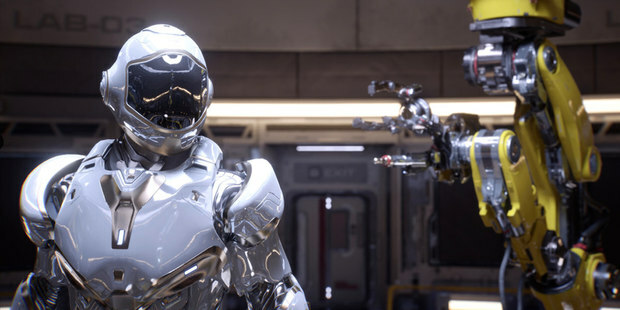 Nvidia CEO Jensen Huang said that the onboard processor will allow developers to have easier access to ray tracing effects, acting essentially as a switch. This will encourage developers to incorporate ray tracing, making it more widespread.